Ugh. I wish that I didn’t have 2+ hours of homework to do for my graduate class. But I will go to sleep eventually, and you can bet I will be putting my head on that pillow, right between my wife and the little author of the post-it note . Sometimes I have a hard time seeing past the things that make life seem “meh” and less than perfect. 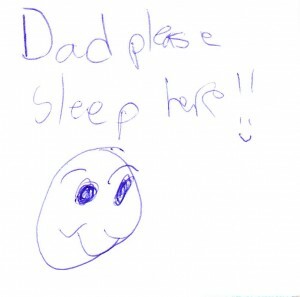 This note is a reminder that when it comes to the stuff that matters – I have am a very lucky guy. I see that my friend and co-host, Elton, has been busy editing our most recent episode of ReThinking Lost. You can check it out at http://rethinkinglost.podbean.com or via itunes. I’m putting the finishing touches on the long overdue Episode 29 of An Apotheosis of a Bombast. It’ll be released shortly. (again, available via itunes or the podbean site). If you’re a regular listener (and let’s face it… if you’re here and not a spammer then you probably are… ), thank you for your support and patience. If you’re not, please do check the shows out. “Ugh” to that, and “ugh” to an overall crummy day. I dunno. I have all these things running through my head, but I should bite my tongue in the hopes that soon I won’t feel the way I do now… about lots of things. Here’s hoping that tomorrow at the very least doesn’t make it any worse… and that maybe there’s some light at the end of the tunnel. Actually, there are lots of not-so-popular songs I like. This is just one the lot. I find it kind of catchy, somewhat soothing, and a little bit sad. Today was my son’s birthday. And I’m very pleased by way he reacted to the birthday present my wife and I gave him. After dabbling a bit with stop motion movies and video puppet theater, we felt he would enjoy having a video camera of his own. Nothing fancy, mind you, just something inexpensive enough that he could be a 9-year-old boy and not get into trouble if it broke, and yet nice enough that anything he filmed would look the way he intended it to. We checked to see what you can get for under $100 at the various stores, and decided to go the route of ebay. After about two weeks to watching what was for sale and researching video cameras that were originally released 9 years earlier or which were blantant knock-offs (I’m looking at you, Sonyo), I found the perfect camera. It was actually the same camera our family has but one notch higher in model number. It had all the criteria I was hoping for: price, accessories, ease of use, quality… I just wondered what condition it might be in. Once I was convinced it was worth the risk, I made my purchase… won the item, and waited for it to be delivered. I knew I would be out of town for a few days, so I informed the seller and asked him to use USPS so that the package would be held during my mail stop. The seller complied but USPS did not. They left the package on my doorstop (it rained for at least two days during my vacation), and I returned home to find a sun baked, water logged box which luckily no one had decided to steal. I’m pleased to say, the item was well packed (in plastic) and proved to be in exceptional, like-new condition. Today, 20 days later, I was finally able to share it with my son… and he LOVED it. We bought him an inexpensive tri-pod and a Klutz book about video tricks, and he played … no, “played” isn’t the right word… he “showed his creativity” all day. He made a stop motion with his mother where a stuffed animal ate some food. He and I used perspective to make a bit of “amateur news footage” of me fleeing from a toy dinosaur, and he just smiled from ear to ear all day long. He must’ve thanked me… genuine, sincere “thank you”s … at least 8 times today. It felt great to see him so happy. As his birthday ends, my wife’s birthday begins and I can only hope that the gifts the children and I have for her will garner a similar reaction. Okay so it’s not The Cure, Depeche Mode, The Smiths, Elvis Costello, or anything like that… but I like it. You are currently browsing the That other blog blog archives for September, 2009.